On our last night aboard T.Elif, I misplaced my water bottle. A castoff from the Orica GreenEdge pro cycling team during their visit to the Tour of Alberta, I enjoyed its uniqueness and as well as being useful, it was a good conversation starter (should my company at the time include cycling enthusiasts). I was sitting in bed reading and noticed that it wasn't occupying its usual spot on the nightstand. I thought I had left it on the table, but no, a search in the morning didn't reveal it in the 'lost items' basket in the dining area. Had it silently slipped overboard in the middle of the night? Or more sinister, was it kidnapped by a fellow passenger or one of the crew? Whatever its fate, it wasn't too great a worry. There were plenty more at home and we still have Sean's to use on the trip. Roll forward a week and a boat trip later. In Çalis Beach, several kilometres north from where the T.Elif let us ashore, we were wandering the beachside promenade with intent on choosing one of the many restaurants for dinner. We selected one, sat down and ... there on a bike, chained to a tree, was an Orica GreenEdge water bottle. Identical ... to ... mine. What are the chances of two such water bottles being in Fethiye, a beach resort far from the pro cycling tours? I like to think it is mine, plucked from the sea by a salty fisherman to find a new life on a bike that cruises the paths of Çalis Beach. What a journey it has had so far! Our lazy days are now punctuated with hikes on shore to walk the ship's dog, Luna. She gets very excited, bounces into the zodiac and takes her position as the maidenhead, with ears flapping and a big smile. 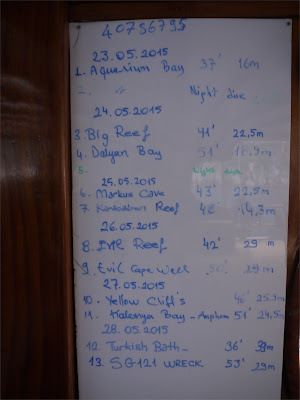 We have explore St Nicholas Island, Knights Island and the mainland around Kalenya Bay. Kalenya Bay has a restaurant and services for boats on a small flat at the bottom of a mountain. It is the mountain we climb. 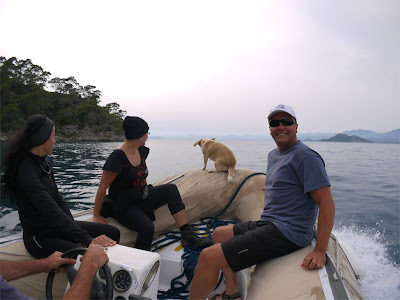 Mehmet, our wiry, cheerful skipper and dive master, bounces up the hill with as much enthusiasm as his much-loved Luna, with the rest of us huffing and puffing behind. Goats, wearing bells, bleat and ring in the distance as we hike along with Luna and two Anatolyian Sheppard puppies (who found and followed us from behind the restaurant) chasing squirrels, insects and each other. The views are amazing. We are able to pluck mulberries (black, white and pink) from the trees as we climb, along with the sweetest, juiciest oranges. Beware, however, of the beautiful oranges in the perfect looking trees. These are a super-sour ornamental citrus, pretty to look at but completely inedible. Even you, Liz Stringer, would have a hard time munching down one of these! Sadly for me, I (Kate) have developed an ear infection so am no longer able to dive. The upside is I am able to read every trashy novel in English onboard the boat. Those of you who have ever been to the Banff Film Festival with me will know I am not good with caves. Or spelunking. And certainly not diving in caves. So imagine my horror to find our morning dive was a cave dive. Not a swim-through where you can see light at the end but a full-on cave. Well beyond my comfort zone, we entered from the zodiac, Seahorse B, and descended to about 18m. And there was a tiny, little tunnel about 3m wide and 1.5m high that we were supposed to wiggle into with scuba tanks. It was dark with our torches throwing pathetically small beams into the dimness. After about 4 metres, the tunnel widen into a small cave. Multitudes of tiny red eyes peered out at us from between the rocks. Their owners, little red shrimp! We then came to a narrow chimney and 10 metres above was a glorious disc of blue water. The temptation was to shoot straight up but I resisted - perhaps only by Mehmet's firm grip on my arm! As we slowly floated up, little red eyes peered out and we suddenly broke out into the safety of blue water through a school of fish. With the little air I had left, we followed a high wall covered in soft corals and the odd anemone. Seahorse B was there to pluck us from the sea when we surfaced. I lived. I enjoyed it but do not get any ideas about taking me spelunking! Dalyan Bay - 36° 36' 10" N 29° 1' 50"
Once again, we have fallen into the lazy rhythm of life on board. However, on Seahorse A, we have taken it to a whole new level. 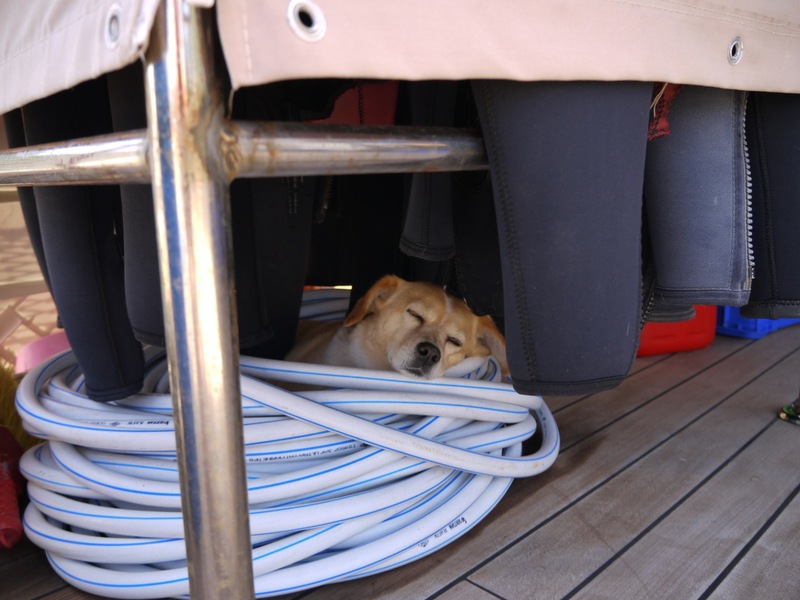 With only four passengers, the crew of six is very attentive to our sleep, eat, swim, dive, repeat schedule. After three dives, Sean and I are getting back into the swing of it, we are maintaining our buoyancy and have stopped kicking each other in the head as we bob around under the surface. It is certainly not the Barrier Reef but there is plenty of marine life to see along with the odd discarded detritus of human life. The water is warm and clear and the sheer rock walls plummeting into the blue depths are spectacular. We are very impressed with this boat and its captain. For the first time in two weeks of being aboard vessels, we had a safety briefing before we left the dock; there are clearly posted safety procedures; we heard the warning sound (should something happen) and we've seen the lifejackets. So much for "safety third." The boat is marvellous, with spacious cabins, big showers, wifi (!!! ), and more deckspace than open ground on our Broadview Road lot. The food is enough to make the wetsuit zippers more and more challenging after each meal (luckily, we can trade up a size or two as needed). It is all good, healthy meals made with local-grown, tasty food except for ... the fish. There isn't much commercial fishing left here (many little fish to please the tourists like us, though), due to 12,000 + years of habitation around the Aegean Sea. Apparently, much of the fish consumed here comes from around Norway. Several more days of diving to go. We will battle on bravely. Waiting for an afternoon departure aboard the Seahorse A. Everything is really, really, really nice. Will write if conditions change. We are aboard the Turkish gület T. Elif, slowly making the voyage from Marmaris to Fethiye. This gület is lovely but not the luxury we enjoyed on the Hemera. 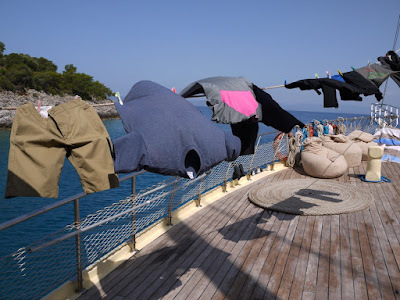 We have easily slipped back in to the lazy routine of life on board: eat, swim, sleep, repeat. The weather is glorious and the water a perfect temperature. With the start of the cruising season, our secluded bays are no longer quite as secluded. The advantage, however, is no longer do we just have the ice cream man come around in his little boat, we also have the bread and baklava boat, the rubbish boat and can choose from any number of water sports from the big banana to para sailing. We have had some excitement by being chased away from military manouvers - helicopters, boats and a rather loud explosion throwing a black plume high into the sky. Sean has expanded his creative talents into jewellery making, producing a very crafty bracelet for me made from a shackle and some rope. There is much envy from our shipmates. This group is not such the great blend as aboard the Hemera but we are having a blast none-the-less. We are doing a lots of swimming in the warm, clear, flat water. My shoulder is holding up to a reasonable distance but I am still eating far more than I could ever dream of burning off! We slept last night on deck under a clear, moonless, star-studded sky. Once our neighbours shut down their noisy parties, it was wonderfully serene. We disembark in Fethiye tomorrow afternoon and join our diving gület on Friday. Life is pure magic. Bodrum is noisy!! Far from being a sleepy beachside town, it is a vibrant, thumping party. The skinny pebble beaches host tables and chairs for dining with the background of noise. Dogs barking, mosques calling to prayer, roosters crowing, jet skis roaring, pirate party gülets doff doff doffing, beachside night clubs also doff doff doffing, women yelling into cell phones, vendors calling out, motorbikes revving, election campaign vehicles blaring - it is not a peaceful place. But what a lot of fun!! Q: When is a haircut NOT a haircut? A: When it is a full-on experience. As happens when you are on the road for months, I noticed I had been slowly getting a bit shaggy and had made a mental note that a trim would be necessary at the next convenient time. When I happened by a "Berber" during our wanderings today, I consulted with Kate to ensure she had the patience to sit and pass the time whilst I had a haircut. She was agreeable to some time out of the sun, so in we went. Well, the haircut started out in routine fashion. Apron in place, scissors out, mono-syllabic communication and hand gestures that I wanted my hair "this short". Snipping commenced, a straight razor gave a clean finish to sideburns, and then my barber deftly lit a rather large throat swab on fire and began hitting me in the face and ears with it. Apparently, this is how they take care of the wee, little hairs around the periphery of cheeks and ears of gentlemen of my vintage. With the language barrier between us, the good fellow that was providing the service couldn't (or didn't feel it necessary) to warn me or explain the whole process that he was about to put me through. Had the haircut started out with something unusual, I might have been on my guard, but no, I was lulled by familiarity until suddenly, there he was, lighting what looked like a benzine-soaked cotton ball on a pencil-length wire. "Hmmmm," thought I, "I wonder what he plans to do with that. Sterilize his scissors? Blow out the inch-long flame to signal, in a dramatic fashion (much like candles on the cake at a birthday party), the cut was over and I was free to go to the till to pay? Oh my goodness, it is still lit and he's bringing it awfully close to my ear-" then, thump-thump-thump he was hitting me with it, grabbed my chin from behind and then wump-wump-wump my cheeks and nose received the same treatment. Even though the heat from the little torch was quite intense, I was too shocked to try to escape. For a second I was worried that he would finally jab the burning skewer into one of my ears to extinguish it with a bit of pizzazz. Kate, who had previously been distracted by a muted Turkish news channel, suddenly had a REAL show to watch. having your head pushed forward towards the big mirror and an up-to-now-unnoticed sink where you go face-first into the bowl and have your hair and, unnervingly, your face wetted, soaped, lathered, rinsed and vigorously rubbed dry. It is surprisingly unsettling to have someone else wash your face from behind. a quick and dramatic snap off of the apron, and an awkward pause as there is no till to go to. Your barber pockets the money right there at the chair. As the Turkish are generally more hairy than the pale, northern-European stock that I come from, the barbers here are practiced at producing clean-edged head of hair. Kate watched ear waxing, plasters, massages, something being done with a thread (with both hands and one part in the barber's mouth) to remove hair ... all happening in chairs beside me, somehow out of sight or in the periphery of my attention. I was glad to say that I survived the ordeal and new grey hairs I may have because of it are all very, very neatly coiffed. 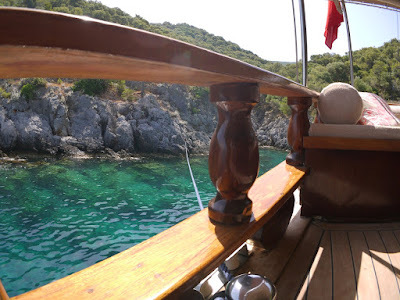 Gökova Gulf - 36° 58' 25" N 27° 35' 50"
The water is clear, blue and warm. And very salty so we float well. Gorgeous! The days run into each other - one beautiful cove to the next. Sleep, eat, swim, eat, swim, eat, sleep.... A world away from internet, cell phones and worries. Struggling to remember what day it is. Other than a few days with afternoon squalls and thunderstorms, the weather has been gorgeous. One such squall did push our gület onto the rocks with a light tap before the stern line was cut (which caused a bit of excitement and an awfully big knife to appear) and we motored off. We moved location, to a more sheltered cove, and life aboard resumed its lazy rhythm. We moored one evening in a marina called Karaca. We all caught a bus to Marmaris to access the internet and replenish our supply of sunscreen. We popped into a store to buy a new USB charger to replace ours that had failed. While in the little electronics shop, Sean helped a desperate lady fix her laptop so she could access her email. We now have an invitation to join her on her yacht on Sunday when we are back - with the promise of Turkish wine as a thank you. Yay Sean!! We are aboard the gület Hemera, along with twelve other passengers and three crew. We boarded three evenings ago and it started much like summer camp. There were shy and quiet introductions, stating names, relationships (for couples) and home cities. There were four Aussies (including Kate), four Dutch (all English speakers), two Brits, two Americans, one Turk with enthusiastic-but-minimal English, and Sean, the Canadian. The crew spoke a bit of English, so we could mostly communicate. Meals were included and prepared in the small, three-square-metre kitchen and were hardy and delicious. Tomatoes, eggplant (aubergene), bread, cheese, eggs, rice, fish and pasta were the staples with fresh fruit and veggies, too. A good-sized (for a boat) cabin with a private en-suite made for a comfortable retreat from the sun and/or the activity of the ship, too. The days have been magical. We awake to the activity of the crew from behind bulkheads - smells of breakfast cooking; the sound of seawater being slooshed (by bucket) across the deck; muffled Turkish commands from the captain as the routine work is being done ... The keen among us can have a pre-breakfast swim. The rest emerge from cabins a few at a time. After breakfast, another swim opportunity, with a side ladder, gunwhales and the top of the pilot house providing your preferred way into the water. We are anchored and stern-tied in a quiet cove with opportunity to swim, paddle, snorkel, explore or just float - this lasts until lunchtime, when we all reconvene at the group table at the aft, sit down to a magically-prepared meal, watch the dishes disappear, then find our lounge cushions at the bow and wait whist the captain pilots us to a different, but equally lovely, spot for a swim in the late afternoon. This is how our days have been. The terrain here is rugged - volcanic rock, piled steeply up from the sea's edge and populated with squat, wide, wind-hardened trees and scrub bush. The little coves we have landed in feel very secluded and private - a tribute to the captain for creating this illusion, as there are hundreds of these gülets out and about right now. There is a steady and light breeze - perfect for sailing. We will be motoring for the whole trip, much to Kate's and my dismay. Schedules will be easier to keep this way, and not all of the passengers would fare as well (or have as much fun) as we would if we were at a 15 degree angle. I do think that a week of being together is about the right amount of time. We are getting to know each other ... just enough. We are widely spread in ages. The youngest is 23; the oldest is 67. People with much life experience (and some with very little) makes for interesting meal conversations. Sheltered and/or differing world views emerge. No advice is given, but many knowing smiles and nods quietly happen. 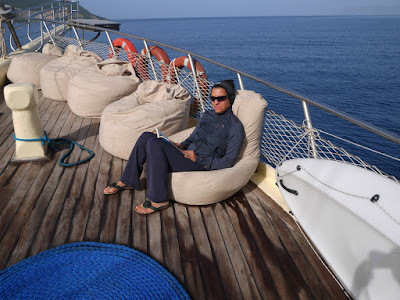 After a frenetic initial pace of activity (unspoken diving competitions and dinghy rides ashore), we have all settled down to a calmer pace for the remainder of the voyage. Books, eReaders and notepads have emerged. Young love; budding romance; lust; even old, weathered-but-granite-hard-and-steadfast companionship are existing on this vessel, peeking from around the corners of conversations and from behind the answers to introductory questions. It is fascinating to be part of. I truly enjoy meeting people and trying to fathom the lessons and examples they have for me. Being in a confined space encourages things along. We are aboard the Turkish gület Hemera sailing around the Gökova Gulf so our silence will continue until the weekend. We have pulled into a marina to replenish water and fuel and caught a bus to Marmaris and wifi!! Thus the quick ping to say we are having a blast. A work in progress. That is our accommodation, the Akkan Beach Hotel. As the tourist shoulder season opens today, they are hurriedly trying to finish a big renovation. Wires hang from ceilings; the pool is 7/8 filled (and sitting unfiltered); the dining area is stacked with boxes of glasses, plates, potted plants in plastic cartons, fridges; paint fumes permeate the hallways, drips of black paint adorn the freshly-laid white marble (!!!) on the stairways. Our room, which is finished, is gorgeous and overlooks the pool and the harbour and the scrambling workmen. The place *will* be beautiful, but right now it is a construction zone. The Turkish-speaking staff are trying to understand their English- and German-speaking guests. This, too, will be resolved. We are the dinner guests who have arrived a half-hour before the invitation stated it would ... only, we are the ones on time. The thing that was ready is the weather. Our hotel is not alone. Half of Bodrum is in final preparations for the season - setting up umbrellas, painting patio furniture. Potting flowers, lining up the banana lounges and stringing the buoys for swimming areas. Last night we went for a walk and ended up at a season opening of a restaurant. Free wine and food certainly makes up for a bit of last minute construction work! Azure, clear water under equally blue skies makes for a marvellous breakfast backdrop. Bodrum is a busy port, with many, many small boats and ships coming and going. It is a starting point for many dive and cruise trips. Diving, sailing, kayaking, motoring, party-booze-cruise-faux-pirate ships ... all coming and going from the docks around this old town. Today, we join a sailing cruise for a week and escape the bustle of this place. There will be NO internet, so expect a quiet few weeks whilst we unplug and have some experiences to write about. Extraordinary! What an amazing place. They believe it was settled since 6000 BC. The Virgin Mary is believed to have lived out her life there and the Gospel of John written there. It is cited in Revelations. Famous people tramped through the marble-paved streets of Ephesus - John the Baptist, Alexander the Great, Antony and Cleopatra, Caesar Augustus, Constantine 1 ... and now, Kate and Sean! What a city it must have been. It had a water supply, a sewer system, street lighting and roads of marble. An existing lagoon was widened and dredged into a proper harbour (hurrah for slave power). It was conquered many times and partially destroyed by earthquakes before being finally abandoned in the 15th Century. The ruins are a fabulous balance between preservation and restoration. There is enough there to give a feel for the scale and height but not reproduced. A popular tourist attraction, it must be unbelievably busy in the summer. Here is a travelling tip - go early before the tour buses and start from the top gate!! Our 800km flight has taken us SW to sea level. The temperature haas leapt up to the high twenties and we are 'suffering' under cloudless, blue skies. We hadn't planned to come here - we had a five day gap from landing in Izmir to boarding our yacht in Bodrum. Kadir, our hotelier in Göreme recommended it. Kusadasi is a resort town mainly frequented by Turks. Reminds me of the Sunny Coast minus the surf but with cruise ships and city walls. We have a suite at the Marina Resort which includes both breakfast and dinner. Vast buffets of tasty dishes ranging from fried anchovies to the reddest, sweetest strawberries and Turkish Delight. The pool is big enough to lap in and the banana lounges are as comfortable as the beds. We look we eat in a third-floor restaurant the looks out over the Aegean Sea and stunning fireball sunsets. The Marina is filled with yachts from exotic ports such as Delaware and Mooloolaba. The water is as clear as it is blue. We are early in the season so it is not crowded. Despite being plenty of Germans around, there are still vacant banana lounges by the pool! Such decadence! Such luxury! All for the princely sum of $75 per night. Hiking in Kapadokya or 'land of the beautiful, wild horses' is amazing. We have been covering 15-20km a day (on the days we hike) and have hiked all the major valleys - Pigeon (named for the pigeon houses carved into the cliffs), Red, Rose, White (named for the colour of the rocks), Love (named for the phallic shaped rock formations) and Sword (who knows!!). Whilst it is difficult to get really lost, we developed losing the trail into an art form. On several occasions, our hiking boots were sorely missed and a rope would have come in handy. The trails are not well marked and finding a dead end at a tiny orchard perched between the rocks in a narrow valley is not uncommon. Spring is here so we are spoilt with a display of wild flowers and blossoms. Throughout the valleys are tiny orchards and vineyards, all in full bloom. Some have been tilled for planting whilst other still sport weeds and flowers. Birds flit around and insects buzz in the sunshine. Small cafés dot the trails selling freshly squeezed orange and pomegranate juice. Turtles and lizards have been the extent of the wild life spotted in the valleys. In town, however, there are an enormous number of dogs, and cats, roaming around and can be quite noisy. Donkeys, horses, chickens and turkeys also add to the raucous. The dogs run yapping after tractors and cars. The drivers are insane with cars flying along the narrow, steep, cobbled streets. Yet, we have not come across a single squashed dog or, for that matter, pedestrian. Boringly, we have mostly frequented a single restaurant - Cappadocian Cuisine. It does live up to its name, serving all the regional favourites. Much to the bemusement of other tourists, we are now greeted with kisses from the maître d'. We have munched our way through most of the menu and if our meal costs more then $20 for the two of us, it is due to excess beer consumption. 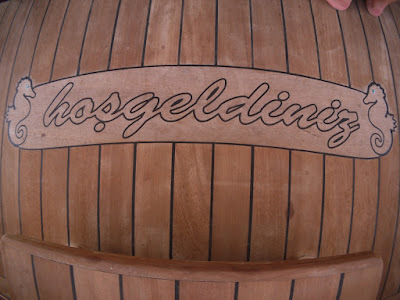 Our hotelier encouraged us to try Cappadocian wine - the red. We obligingly sampled several and find them most enjoyable. They have had a lot of practice after all, wine has been made here for more than a millennium! We have had hot weather, rainy weather, thunderstorms and rainbows but our enthusiasm for this extraordinary place is undampened.